1. From the yellow cardboard we need to cut two identical circles. This will be the basis for our sweet sun. 2. 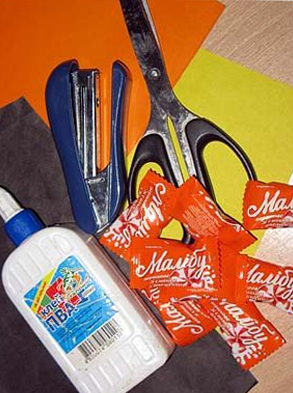 Take the first yellow circle and with the help of a stapler attach on a circle to it candies. 3. 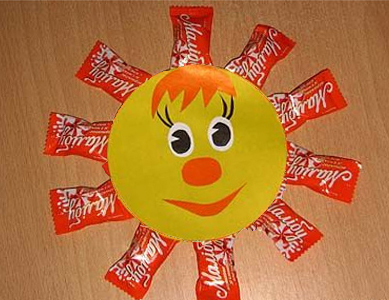 Cut with scissors from colored paper nose, eyes, mouth, forelock for our sun and glue them to the second yellow circle. 4. Glue two yellow circles. All! 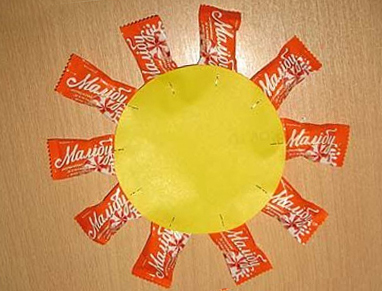 The sweet sunshine is ready. If you want, you can write your wishes on the reverse side of the crafts.